Let’s jump into the river of winter styles and glamour to enjoy the season in the best way. Almost all branded winter collections have hit the market and make it look all the more colorful and magical. Your charm of buying new seasonal dresses must be on its peak now-a-days and your urge to shop new arrivals can be treated by serving you with a plenty of colorful winter prints here, so you may grab the classier ones and entertain your closets with some chic attires. We are pleased to share the very new and classy branded collections with exclusive designs. Today’s post will cover a stunning series of Zeen Winter Dresses 2016 Designs by Cambridge. Some magnificent designs of popular brands and designers have already been uncovered in our Winter Fashion Gallery while a few awaiting collections are just to be dispatched soon. A similar assortment full of remarkable fall prints has been brought to you via this post. This astounding array of dresses will surprise you with its unbeatable charisma and magnetism. The classy series has put forward by the very popular Zeen by Cambridge. Zeen by Cambridge is a new addition to Pakistan’s Clothing and fashion market which has been recognized as a quality fashion house within a very short span of time. Coming into existence in the year 2014, Zeen has really surprised the fashion lovers by its devastating designs, which is a clear proof of worth appreciating efforts of the brand’s owner. For, coming to the top in such a short period of time is not a simple thing at all. This makes the brand a preferable choice of fashion forward people. Zeen being a complete fashion portal, deals in best quality fabrics, sweaters and accessories including clutches, bags and jewellery for women. The previous fall assortment which was the brand’s first volume was greatly liked and appreciated by public and the new collection is again anticipated to be as perfect as the previous one. Let’s break the surprise and present you the classy new arrivals in this session. Zeen Fall Winter Collection 2016-2017 enriched with latest and beautiful designs of pret and cambric winter suits has now been released for the most charming season. This array of dresses has been overflown with very tasteful and pretty designs of cambric and pret suits in stitched as well as ready-to-wear format.The dresses have been decorated with gorgeous designs of embroidery and textile designs. Your perfect selection from this assortment of Zeen Winter Dresses may bring a magic to your wardrobe. 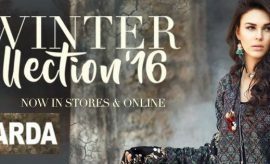 Zeen Winter Catalog 2016-2017 has been added here. All the Zeen winter arrivals have been displayed inside this fashion booklet. Have a look at these trendy suits by Zeen and pick up your favourite ones. Zeen’s exclusive designs for fall winter 2016 are as impressive as anticipated. Women of all age groups can find this assortment as the best one to refill their winter closets with these overwhelming designs just introduced by Zeen. Let’s explore all articles with their details and prices. This winter apparel with a chic Ottoman print on neckline in a wonderful contrast of blue and red is a perfect choice for smart ladies. It costs only 3195 rupees. This stunning Aquamarine print embellished with citrus blooms is a chic cotton khaddar apparel complemented with beads and lace. This black and white ethnic pattern is a fabulous composition of the Zeen Cotton Khaddar series for this autumn Winter. This Saffron colored Sunlight Rapture Linen Viscose suit embellished with a pearl white colored intricate embroidery has all in it to surprise all. This design of Indian Chintz Floral printed shirt with an ethnic motif on the neckline paired with a dupatta and dark red shalwar in linen viscose stuff offered by ZEEN is a reasonable choice worth 3295 rupees only. This white shirt embellished with a French floral pattern is paired with a blood red printed dupatta and plain trouser. The stuff used in it’s composition is Linen Viscose. Embroidered neckline with a chinese floral pattern on pear green colored shirt along with printed dupatta and plain red pants is a perfect article from the Zeen Cotton Series. Start this season’s shopping with this fabulous Cotton Khaddar suit by Cambridge Zeen. The unstitched three piece full suit costs 3195 Rs only. The chic crisp print adorned with botanical element in beige color and Cambric stuff by Zeen displayed in the following picture will surely surprise you with it’s charismatic essence. This is available as single shirt. 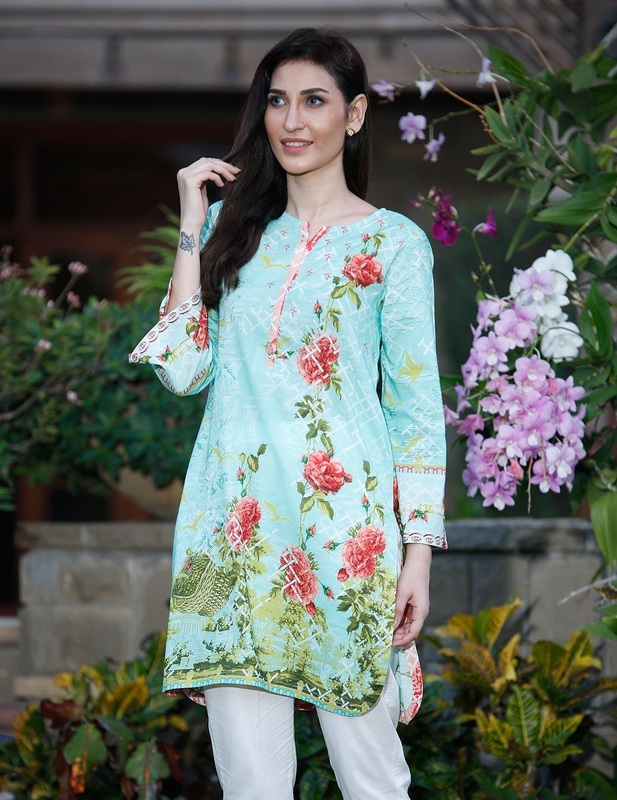 This Aqua Adore Hues print by Zeen is available as One Piece single shirt in One Thousand Three Hundred and Ninety Five Rupees. The perfect combination of light pink with blue in cambric stuff available as single shirt in Zeen Cambric Winter Collection is a perfect choice available for smart girls. This beige print with bright red contrast and Victorian elements on the shirt is a wonderful dress for hangout with friends and also as a casual wear. This tie and die Chevrons print in blue and white contrast is a Viscose Linen outfit composed as a two piece winter suit including shirt and bottom. This pretty Zeen Vintage Blue in Navy shade with a pure white base and casual print all over the fabric is another stunning article of the series. This one is probably the most expensive article of the series but its brilliant design makes it worth paying off. The dusty rose colored three piece outfit has been paired up with a bright yellow woollen shawl. In the complete series of Zeen Winter Arrivals 2016 dispatched above, this specific print belongs to the classy winter fabric Karandi, which adds to the beauty of the print. This apricot colored cotton Khaddar suit is an unstitched article with elegant blue colored floating waterlilies as print. The three piece article costs 3195 rupees only. The Amazon Moss Grey cotton khaddar winter outfit by Zeen embellished with bright yellow flowers can give you a magical look this winter. Grab it now from the Zeen store in three thousand one hundred and ninety five rupees. Last but not the least, comes this stunning Autumn Gold Aztec Geometry Cotton Khaddar suit which surely is the most elegant of the entire collection. How were the designs and prints of these Zeen Winter Dresses? Do not forget to leave your feedback about this astounding Zeen Winter Dresses Fall Collection in our feedback section below. You may get these dresses from the official Zeen outlets or the Zeen estore. Stay connected with Stylesglamour Winter Arrivals Gallery for more new fall arrivals and seasonal fashion stuff.